The latest House of Cards Season 6 trailer finds Claire Underwood's leadership abilities being questioned. Robin Wright's Claire is the first President of the United States, after her husband, Kevin Spacey's Frank Underwood, resigned. Spacey was fired from the show after multiple men came forward and accused him of sexual misconduct. The House of Cards writers wrote him out of the show by killing him off screen, leaving Wright to do the heavy lifting for the sixth and final season of the hit Netflix political drama. Claire Underwood is out to prove herself as the rightful President of the United States in the new trailer for House of Cards. "I'm not going to be told what to do anymore, not by you or any man, ever again," says Claire to Frank Underwood's former righthand man, Doug Stamper (Michael Kelly). The trailer begins with a bunch of news footage criticizing Claire's leadership and then goes on to show strife behind-the-scenes as well. There's also a tease that the hit show might not end so well for Wright's trailblazing character. The teases of violence and murder is something that House of Cards has never shied away from, and that's not going away for the final season. 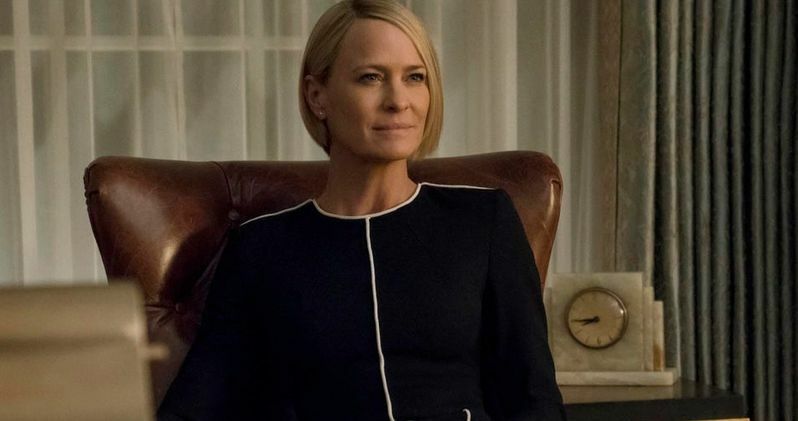 Glimpses of a body bag, somebody getting shot, and a grave being dug are only some of the little flashes, along with some scenes featuring Doug Stamper turning to his dark side that hint that Claire Underwood might not survive her term as president. There's going to be some twists and turns coming our way, but it will all be told in eight episodes instead of the usual thirteen. Golden Globe winner and Emmy Award nominee Robin Wright returns as President of the United States in the award-winning, Netflix series House of Cards, which also stars Academy Award nominees Diane Lane and Greg Kinnear. Cody Fern is on board alongside Emmy Award nominee Michael Kelly, Jayne Atkinson, Academy Award nominee Patricia Clarkson, Constance Zimmer, Derek Cecil, Campbell Scott, and Boris McGiver. Melissa James Gibson and Frank Pugliese continue as showrunners for season six, and they serve as executive producers along with Wright, David Fincher, Joshua Donen, Dana Brunetti, Eric Roth, Michael Dobbs, and Andrew Davies. House of Cards Season 6 will premiere exclusively on Netflix November 2nd. Production on the final season was shut down twice in October of 2017, once for an active shooter near the set, and then again at the end of the month when the Kevin Spacey allegations became public news. Spacey was swiftly fired from the show, and then it was announced in December that the show would continue on without Spacey, starting production back up in early 2018. While some House of Cards fans have been skeptical of the series without its lead actor, the trailers look like everything is going to be just fine. You can watch the latest trailer for the sixth and final season below, thanks to the Netflix streaming YouTube channel.